An inflatable hot tub is a great place to sit back, relax and simply enjoy the pleasures of life. However, choosing one can be a bit harder. Each brand has their own features, sizes, specifications and more. We’ve extensively researched all the top models and came to the conclusion that the Coleman SaluSpa 4 Person Portable Inflatable Outdoor Spa Hot Tub is best inflatable hot tub out there. It features generous seating for four adults and offers an incredibly relaxing experience. The 60 built-in soothing bubble jets are great for sore muscles and the included filters keep the water fresh and clean. Add onto that the digitally controlled pump, durable 3-ply PVC walls and included cover and you can easily see why it’s our top pick. Keep reading below for our full review of the Coleman SaluSpa. Why do I need an Inflatable Hot Tub? How Much Electricity does an Inflatable Hot Tub Use? How Safe are Portable Hot Tubs? What Should I look for in an Inflatable Hot Tub? 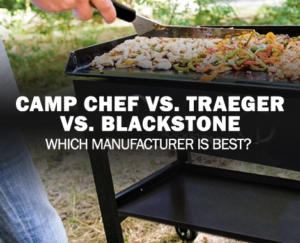 We’ve included the below table so you can quickly and easily compare all of our top choices. Coleman SaluSpa 4 Person Portable Inflatable Outdoor Spa Hot Tub View Review - 71" x 26"
Coleman Lay Z Spa Inflatable Hot Tub View Review - 77" x 28"
Intex 77in PureSpa Portable Bubble Massage Spa Set View Review - 75" x 28"
SaluSpa Miami AirJet Inflatable Hot Tub View Review - 71" x 26"
Goplus 4 Person Portable Inflatable Hot Tub View Review - 71" x 26"
SaluSpa Siena AirJet Inflatable Hot Tub View Review - 98" x 39" x 26"
Intex Pure Spa 6-Person Inflatable Portable Heated Bubble Hot Tub View Review - 85" x 28"
Coleman SaluSpa 6 Person Inflatable Outdoor Spa Jacuzzi Bubble Massage Hot Tub View Review - 77" x 28"
Best Way SaluSpa Palm Springs AirJet Inflatable 6-Person Hot Tub View Review - 77" x 28"
Intex PureSpa Bubble Hot Tub and Pool Set View Review - 152" x 70" x 28"
If you’re looking for an inflatable hot tub, there is a good chance you’ll want one with a 4-person capacity. These are in general the best bang for your buck and offer a lot of great features at an affordable price point. Plus, they don’t take up too much space and are easy to move around if necessary. As our top ranked choice, the Coleman SaluSpa 4 Person Portable Inflatable Outdoor Spa Hot Tub is an incredible blend of technology, comfort and durability. This unit comes with 60 soothing bubble jets and a cushioned interior for an outstanding spa experience. Setup is unbelievably easy and the 3-ply PVC walls are exceptionally rip resistant. Plus, it comes with 2 spare filter cartridges for extended use. When topped off, the Coleman SaluSpa can hold up to 192 gallons of water and can heat it to a steamy 104 °F. This temperature is perfect for relaxing sore muscles and aching knees. Plus, when it’s time to take this inflatable hot tub down for the season, it has convenient drains and lift handles to make the task a snap. Overall, this is a phenomenal inflatable hot tub and easily the best on the market. With a spacious interior and extremely comfortable air cushioned floor the Coleman Lay Z Spa Inflatable Hot Tub is an excellent choice. It boasts an intuitive soft touch control panel for easy operation and intelligent automation. Furthermore, it’s wall are made from an extremely durable TriTech material which is nearly impervious to rips and tears. When coupled with the easy no-tool setup this inflatable 4-person hot tub is a dream come true. 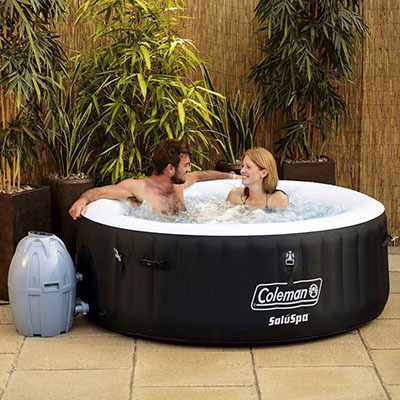 The Coleman Lay Z Spa has a generous 254-gallon capacity and is perfect for four adults. You can even fit in six people if you don’t mind a bit of a squeeze. We love the included inflatable cover and the include water filters as they keep our portable hot tub free of dirt and debris. Overall, this is a first-rate inflatable hot tub and very budget friendly, especially considering its size. If you’re looking to soak in spacious, cushioned comfort, look no further. The Intex 77in PureSpa Portable Bubble Massage Spa Set is perfect for relaxing after a long day on your feet. The 120 built-in bubble jets stimulate your muscles for a deep and refreshing massage. Meanwhile, the easy to use control panel allows for precise temperature adjustment for a personalized experience. We also love the included hard water removal system as it makes the water luxuriously smooth. 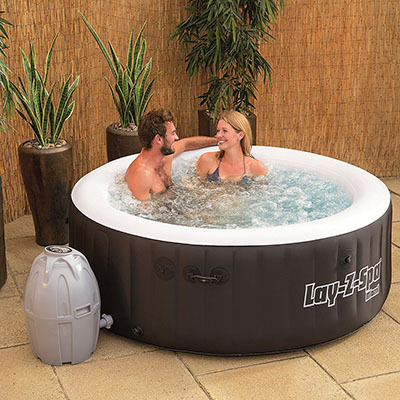 Size wise, the Intex 77in PureSpa is on the larger end for a 4-person inflatable hot tub. This makes it great for stretching your legs out and provides ample room for additional guests. As with our other top choices, assembly is very straightforward and the Fiber-Tech walls are incredibly puncture resistant. In summary, this is a great option with a spacious interior, tons of included accessories and a host of great features. A cheap inflatable hot tub is great if you’re not ready to spend the money on an in-ground unit, or simply prefer a more cost-conscious option. They offer excellent compact designs and significantly lower energy usage. While not as popular as a 4-person inflatable hot tubs, they offer excellent features and super portable. For a budget inflatable hot tub, the SaluSpa Miami AirJet Inflatable Hot Tub offers an incredible amount of value. From the quick tool free assembly to the puncture resistant TriTech walls, this unit can go head to head with much more expensive options. The SaluSpa Miami has a large 71” diameter tub which is perfect for 2-4 adults. Plus, it is packed with additional accessories and even includes a handy setup and maintenance DVD. The 120 built-in bubble jets generate a wonderful massaging sensation, while the powerful heater is able to keep the water at a balmy 104 degrees. Similar to high-end models the SaluSpa Miami AirJet Inflatable Hot Tub comes standard with a host of additional features. These range from the inflatable cover and chemical floater to the intuitive control panel and water filtration system. If you’re thinking of picking up a cheap inflatable hot tub, this is easily the best choice due to it’s price and absolute stellar design. The Goplus 4 Person Portable Inflatable Hot Tub is the absolute cheapest inflatable hot tub on the market that we’d recommend. While this unit does sacrifice a bit in build quality and material choice, it still has it where it counts. The included bubble jets provide a relaxing and comfortable spa experience and the control panel allows you to adjust any settings without having to exit the hot tub. We were also pleased to see it came with an included repair kit. While not a big feature it’s still handy and something that a lot of higher end models lack. The built-in drain is conveniently placed and allows you to quickly drain the unit for storage. Plus, the Goplus 4 Person Portable Inflatable Hot Tub comes with an insulated ground cloth as well as an insulated cover for enhanced efficiency and lower energy bills. One thing we do want to note is that replacement filters can be a bit tricky to find. Make sure you have a few on hand in case you’re not able to purchase one online. 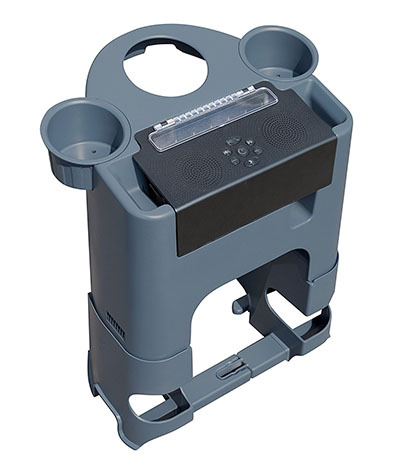 For such a robust unit, the Goplus 4 offers a truly low cost option and would be right at home on any back patio. When it comes to 2-person inflatable hot tubs, your choices are fairly limited. Most people opt for a slightly larger 4-person unit and simply enjoy the extra space. However, if you’ve got space constraints this might be just what you’re after. 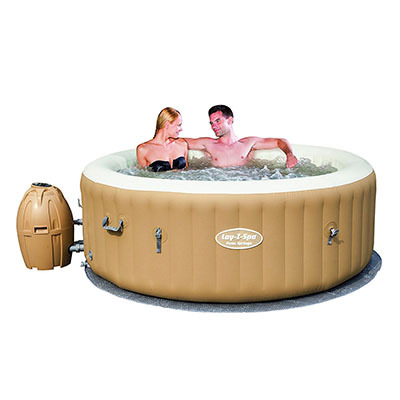 The SaluSpa Siena AirJet Inflatable Hot Tub is a unique oblong shaped unit that is perfectly sized for two adults. With 120 all-surrounding air jets, you’ll be enveloped in pure luxury. This portable hot tub is great for soaking sore muscles and unwinding after a long day. Plus, due to its design you can easily converse with your partner for a romantic evening. Not only that, but it includes an automatic start/stop feature to save energy and your wallet. Another great addition is the included beverage table. This handy accessory allows you dine and drink in heated bliss. It’ll give you a handy place to store your phone or tablet at arm’s reach too. With only 135 gallons of water at max capacity, the SaluSpa Siena AirJet Inflatable Hot Tub is also one of the fastest to heat up. You can expect to have hat 104-degree water in under 16 hours, even less if you use pre-heated tap water. If you’re looking for a personal hot tub for two, this is a perfect choice. A 6-person inflatable hot tub is great for entertaining guests, hosting parties or simply hogging all to yourself. The larger design allows for greater heat retention and reduces the need for chemicals. Plus, who doesn’t like being able to float around in a glorious, heated bliss? With simple to use controls and a huge water capacity, the Intex Pure Spa 6-Person Inflatable Portable Heated Bubble Hot Tub takes the number one spot in the 6-person category. It boasts an ultra-durable Fiber-Tech, puncture resistant exterior and a super comfy cushioned air pad floor. Plus, the sidewalls are more than sturdy enough to sit on so you can enjoy dipping your feet in to the water. Meanwhile, the included PureSpa function activates all 170 of the high-powered bubble jets for enhanced relaxation at the touch of a button. Also included with the Intex Pure Spa 6-Person Inflatable Portable Heated Bubble Hot Tub is a high-quality cover and insulated ground cloth to help trap in residual heat. We were impressed with the digital soft-touch control panel. It made it easy to change heat and bubble settings, while also providing auto shut off safety features and optional energy saving modes. Overall, this is one of the best inflatable hot tubs out there and easily the largest on our list. If you’re planning to entertain guests, friends and family, you’ll want all the extra space you can get. As a well-known and trusted brand, we’ve learned to expect great things out of Coleman products. As expected, the Coleman SaluSpa 6 Person Inflatable Outdoor Spa Jacuzzi Bubble Massage Hot Tub doesn’t disappoint. 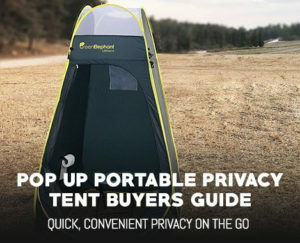 With great features like the Lay-Z Massage system and rapid heating capabilities it is a great addition to our list. It has an incredibly reliable digitally controlled pump and a waterproof control panel for easy adjustments. Not only that, but the entire unit undergoes strict quality testing for enhanced longevity and reduced maintenance. 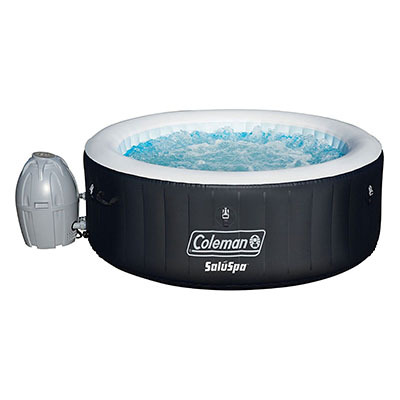 The Coleman SaluSpa 6 is manufactured with tear resistant TriTech inflatable walls that are not only durable, but super comfortable as well. At 77” wide and holding 254 gallons this is quite a large inflatable hot tub and perfect for 4-6 adults. Plus, the built-in heater can create a steaming 104 °F water bath that’s perfect for sore muscles and aching backs. This unit also comes with nearly every accessory you’d ever want, from a high-end leatheroid pool cover to the ever-useful floating chemical dispenser. Overall, this is a stunning portable hot tub and an excellent combination of size, value and quality. While we personal think it’s a bit of a squeeze, the Best Way SaluSpa Palm Springs AirJet Inflatable 6-Person Hot Tub does offer room for six adults, albeit with not much room to spare. However, with such an incredible bubble jet system and luxurious heat, you’ll soon forget all about the space constraints. We were impressed with the quick tool-less setup and the easy to change filter cartridges. These make reposition the hot tub and maintenance much easier. Similar to out other top models, the Best Way SaluSpa Palm Springs Hot Tub offers a high-tech digital control panel where you can adjust nearly every setting from the comfort of the hot water. Furthermore, the unit comes standard with a durable ground cloth and pressure gauge so you can make sure your inflatable hot tub stays warm and at just the right pressure. With and incredible 242 gallons of water you’ll have a blast slipping into the rolling bubbles and relaxing after long day. Overall this is another great option and should last you for many years of continuous enjoyment. If you looking for a truly unique inflatable hot tub experience, a hot tub and pool combo is a great way to go. It gives you the heat to relax sore muscles and yet still provides that classic refreshing pool experience. You’ll want to have some space available though as these take up quite a bit of room. 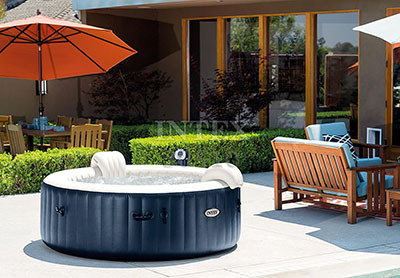 As one of the only inflatable hot tub and pool combos on the market, the Intex PureSpa Bubble Hot Tub and Pool Set is the clear winner in this category. It holds an enormous 520 gallons of water and is truly an incredible sight once fully set up. It’s totally unique design is perfect for families. Kids can play in the pool while adults lounge in the hot tub, comfortably surrounded by heated water and massaging bubbles. Plus, with durable Fiber-Tech walls you can be sure it’ll survive any pool toy accidents. The hot tub section is more than large enough for 4 adults, while the pool can easily hold 6-8 people depending on their size of course. The Intex PureSpa Bubble Hot Tub and Pool Set comes with two handy inflatable benches which make getting in and out of the pool safe and easy. Similar to our other top choices this unit also boasts in impressive touch control panel and a robust water filtration system for maximum enjoyment. If you want the best of both worlds and enough space for the whole family, this is the unit to get. Inflatable hot tubs may seem like a bit of a luxury purchase, and that’s true. However, they also provide a wealth of health benefits that can drastically improve your overall well being. We’ll take a look at just a few of these in the section below. Everyone know that stress puts a lot of added pressure on your body. What most people don’t know is that it also leads to a weakened immune system, causes high blood pressure, fatigue, depression, anxiety and can even lead to heart disease. An inflatable hot tub is a great way to relieve this built up stress. The massaging jets and warm water provide a relaxing outlet where you can feel calm and leave your worries behind. After a long soak you’ll get out feeling much better and your overall cognitive function will be drastically improved. When compared to a traditional in ground hot tub, an inflatable model is way cheaper. We’re not talking about a few hundred dollars either. A typical hot tub costs between $6,000-$10,000 while a comparable inflatable hot tub would be $500 max. Plus the cost to operate an inflatable tub is much cheaper. If you’re not using it, just deflate it and store it in the garage. Good luck trying to do that with an in-ground unit. 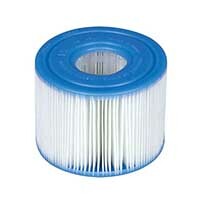 Plus, replacement filter cartridges are typically much more expensive for an in-ground unit. Even more, you’ll need to use a lot less chemicals in an inflatable hot tub as they have a smaller water capacity and don’t take much at all. Most People choose to purchase an inflatable hot tub for a relaxing backyard retreat. After a long day on your feet, nothing feels better than slipping into a blissfully warm hot tub and enjoying a luxurious air massage. Plus, it’s a great place to have an enjoyable conversation with your partner in a relaxing atmosphere. To truly make it a relaxing experience, leave all your phone, tablets and e-readers inside and simply enjoy the cozy water. A hot tub also makes a great place to meditate where you can free your mind of any leftover baggage and leave feeling refreshed and reenergized. No one can fully escape the aches and pains of a long day out and about, however an inflatable hot tub can greatly reduce their effect. The warm water of a hot tub is a great way to relax muscles as the heat penetrates deep into the body. Not only that, but it helps to stimulate blood flow and increases circulation. Plus the massaging air jets in combination with the heated water helps to increase your range of motion and reduces any stiffness caused by age, ailments or simply overwork. There is a reason why athletes relaxing in a hot tub after a long workout, and we can assure you it’s not to just play with the bubbles. Another common reason to purchase an inflatable hot tub is to entertain friends, family and guests. Both adults and children alike can enjoy the roiling heated waters and reap the aforementioned health benefits. Plus, it’s a great place to have a few beers and a couple of snacks while enjoying a leisurely summer evening or watching the big game. Whether you’re pulling it out for a quick weekend party or enjoying weeks of continuous use, an inflatable hot tub is a great option for entertaining and won’t break the bank. This is a rather tricky question as each inflatable hot tub pump uses a different amount of energy. However we can make a few general assumptions to answer it. In general though a standard inflatable hot tub will cost about $50/mo to keep constantly running. The first is that your hot tub is using a standard 110V outlet, the type you typically find in your home. While these are less powerful than a 220V connection they are much more common and still work perfectly. The second assumption is that you’ll be using water straight out of a garden hose. Depending on the time of year it’ll be between 40-60 degrees. We’ll use an average of 50 degrees for this calculation. The third assumption is the overall size of your inflatable hot tub. Larger models take more energy to heat up and likewise, smaller models use less energy. Base on our top choices, we’ll use a fairly standard 200 gallon capacity as it is a fairly common size. Using these three numbers a doing a quick calculation shows us that $50/mo is just about right. But again, there are a ton of factors that can affect that, from location, ambient temperature and hot tub insulation quality. In general though, they are not very expensive to run, especially when compared to a typical large in-ground hot tub which can cost upwards of 3 times as much. If you practice proper hygiene techniques and use all pool chemicals as directed, a hot tub is a very safe and enjoyable place to relax. However if you don’t you can potentially have a health concern on your hands. Bacteria likes to grow in moist, hot places and a hot tub is like a vacation resort for them. This is why you must use your pool clean chemicals appropriately and keep the water in pristine condition. You’ll also want to shower both before and after getting in an inflatable hot tub as many skin care products can react with the pool chemicals and cause rashes, or painful skin irritation. A quick rinse is all you really need and it’ll go a long way to keeping your next hot tub dip an enjoyable experience. Heat wise you don’t really have an issue. Unlike in-ground hot tubs which can reach 115 degrees and higher, inflatable models typically max out at 104 degrees. This lower max temperature is not dangerous to adults or children and is still super cozy for those chilly fall nights. Overall, just keep up on the hot tub maintenance and take a small shower before jumping in and you’ll have nothing to worry about. Before purchasing an inflatable hot tub, you’ll really need to understand what you actually want. This should include the size of the unit, available features, material selection and max temperature. Each of these play an important role in selecting the best inflatable hot tub. In this section we’ll review general guidelines so you can head into the buying process being informed and prepared. When it comes to size, the key determining factor is how many people you want to fit in the inflatable hot tub. We’ve take a look at a lot of hot tubs and after some research and testing we’ve come up with the below recommended minimum sizings. Keep in mind however, that if you lean more towards the lower end of the spectrum you’ll have a limited amount of hot tub space. We’d recommend you try to go 5” above these recommendations so have a bit of room to stretch out and if necessary accommodate a few unplanned guests. This is the probably your biggest concern when it comes to choosing the right inflatable hot tub, and for good reason. After all, the right features can make or break an otherwise awesome purchase. First up on our list are bubble jets. These small holes are located on the bottom of inflatable hot tubs and provide the rolling and bubbling you’re accustomed to seeing on spa quality units. Depending on the size of the holes and the power of the pump, you’ll want at least 60 of these surrounding the unit. They will give you that great relaxing massage and help aerate the water so your skin stays nice and happy. To go along with the bubble jets, you’ll also want to look for a digital control panel. This allows you to quickly change any settings, from the bubble speed, water temperature and more. Make sure that the panel is conveniently located too. You want to be able to reach it while sitting in the inflatable hot tub for easy of use. The control panel should come standard with an automatic safety shutoff feature as well. This helps to prevent overheating and ensures the tub stays in tip top condition and ready to use. It also lets you cycle the water and informs you when it’s time to change the water filters. If a hot tub doesn’t have a control panel, we’d recommend you instead opt for a more advanced unit. Another great feature that you’ll find on many high-end inflatable hot tubs are cushioned floors. 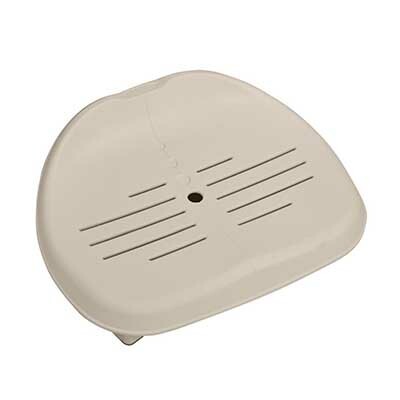 These are inflated with the main hot tub unit and provide excellent air padded comfort. Most inflatable hot tubs don’t come with built in benches or chair, so a cushioned floor is an excellent way to relax without having to buy any additional accessories. Plus it’s really easy on your knees and you won’t risk bottoming out on the ground if you accidentally slip while getting in. The right material choice plays a huge part in the overall quality, durability and longevity of an inflatable hot tub. Cheap options are made from single or dual ply (layer) materials, while more expensive units come with triple ply or custom engineered fabrics. As you increase the ply count you’ll have a significantly more rip and tear resistant material. This will make it much harder to spring an accidental leak and is very resistant to the elements. Thinner materials are easily punctured and typically won’t last more than a season or two at best. If you see a material such as TriTech or FiberTech those are both triple ply materials and offer enhanced puncture resistance and extended outdoor life. All inflatable hot tubs come with additional included accessories. Some however, come with a lot more than others. Below are a few items you’ll want to be on the lookout for. The more of them that come standard with the inflatable hot tub, the less you’ll have to purchase later. 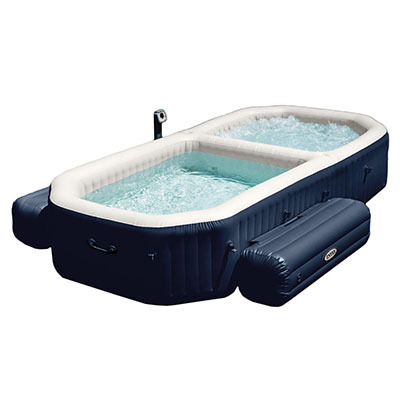 While it is possible to find these inflatable hot tub accessories after the fact they are just so much easier to get right when you’re buying the unit. Plus, the manufacturer can ensure they are the right make and model for your system, saving you the trouble. While you might think this is a critical feature, it’s actually the one you need to worry the least about. All portable hot tubs will have a max temperature of 104°F. This is due to a CSPC advisory #79-071 which states that water over 106°F has the potential to cause heat strokes. Simply put, if you see an inflatable hot tub with a max temperature over 104°F you should be a bit skeptical and maybe look at a different option. Similar to a standard pool or in-ground hot tub, inflatable hot tubs do require a bit of maintenance to keep them up and running. Overall it’s a fairly easy process and as long as you keep up with the schedule you should be spending 99.9% of your time enjoying the warm water instead of cleaning it. Once a week you’ll want to grab a test kit and test the water of your inflatable hot tub. The included owners manual shows you the desired values and you can add various chemicals or tablets included in the water balancing kit to reach it. On average you’ll want the pH to be between 7.4 to 7.6, any lower and you risk damaging the sidewalls and degrading the tub material. The alkalinity should be between 80-120 ppm, if it stray outside that you’ll want it adjust it as necessary. A few hours before each use, or weekly if you’re not actively using it, you’ll want to sanitize your inflatable hot tub water. To do so, just pour the recommended amount of sanitizing solution directly into your hot tub. It is fairly fast acting and will quickly kill off any bugs or bacteria that might be floating around. Each week you’ll want to remove the water filter and clean it of any excess dirt or debris. Each inflatable hot tub has them configured in a different way, so be sure to consult your owner’s manual for the correct way to remove, replace and clean your specific filter. Cleaning the filter is very important any particle that get past it can quickly clog your pump, and the surrounding plumbing which can lead to undesirable leaks and low flow issues. Typically you’ll find the filters outside the tub’s exterior and located close to the ground and near the heating unit. For most models there will be a screw-type cap that covers the filter. Simply unscrew or unhinge it to access the water filter cartridge. You should be able to gently wipe away most large debris with a paper towel. For any finer particles you’ll want to take the filter and pass it back and forth under running tap water. If you’ve previously had an in-ground hot tub, you’ll find that the smaller portable hot tub filters tend to clog a bit more often and need to be regularly cleaned. Unless you see something fishy going on, every three to four weeks you’ll want to drain your inflatable hot tub completely to clean the interior surfaces. This is a fairly easy task as most portable hot tubs should have built-in drains near the bottom to quickly release stored water. After emptying the unit, you can clean the insides usings a mild soap and water cleaner along with a damp sponge. You’ll want to make sure that after cleaning you completely rinse out the unit and rid it of any residual soap. If you’re planning on storing the hot tub for the rest of the season you should wait for it to thoroughly dry before deflating and folding it up.Otherwise, you can cause unwanted mold and mildew to develop on the unit. However, if you’re still going to use it, you can fill it up with hose water, give it a quick pH testing and toss in some hot tub sanitizer before heat it back up to your desired temperature. In the unfortunate event that inflatable hot tub rips or tears, you can follow the below steps for a quick and effective patch. However, before starting you’ll want to grab either the Boxer 859 Adhesives Under Water Vinyl Swimming Pool Repair Kit or the Boxer Adhesives Peel and Stick Vinyl Plastic Pool Patch if your inflatable hot tub didn’t come with a repair kit. These will allow you to seal small and medium sized holes and tears without having to have a professional come out or require replacing the entire hot tub. There are two types of repair kits out there, ones that can be used underwater and others that need to be applied dry. Overall we find the dry application to provide longer lasting repairs. To use these follow the below steps, or watch the video. Completely drain your inflatable hot tub. Mix up a bit of soapy water in a spray bottle and spray around the leak to see exactly where, and what size it is. Use some mild cleaner to clean the affected area and wipe it off with a dry paper towel. Fill up your repaired inflatable hot tub and enjoy. Over time, any moving or filtering components on your inflatable hot tub will wear down and eventually need to be replaced. The good news is that replacement parts are readily available for most name brand inflatable hot tubs. We’ve gone ahead and made a convenient list of them below so you can quickly find what you’re looking for. We’d recommend you get a pock of replacement water filter cartridges when you first buy your inflatable hot tub. This will prevent you having to scramble at the last minute to pick them up when you figure out they are clogged. Also, you can clean them quite a few time before they degrade. So don’t worry about replacing them every time, once a month should be more than enough unless you’ve got something really nasty plugging it up. As we mentioned in the above inflatable hot tub maintenance section you’ll need a few chemicals to keep your new purchase in working condition. These chemicals are quite cheap and readily available. Below you can find a links to the most common ones you’ll need for a safe and bacteria free hot tub experience. You also might want to pick up a digital pH tester like the Risantec Digital PH Meter Tester as over time it’ll save you money when compared to the strips. In general though an inflatable hot tub is pretty easy to care for and if you buy all the above chemicals once, they should be enough to last you for a long time. One of the great reasons we love inflatable hot tubs is just how affordable they are, especially when compared to their in-ground counterparts. This extra savings means we don’t feel quite so bad about splurging on a few nice to have accessories. Below we’ve listed six of the best inflatable hot tub accessories on the market. They will go a long way to making your personal spa feel like a little slice of heaven.. When it comes to enjoying an inflatable hot tub, a good drink can really help to make the experience a memorable occasion. However you’re always left with the question of where to put it when your done. That’s where the Intex PureSpa Cup Holder comes in. With two individual cupholders and a handy tray for snacks and phones, it’s the perfect hot tub accessory. Plus, it’s easily removable for convenience and made from durable plastic that won’t mind the hot, humid environment. If we had to pick one item from our list of inflatable hot tub accessories, this would be it. Another great accessory and one that can vastly improve an already comfortable experience is an inflatable hot tub headrest. 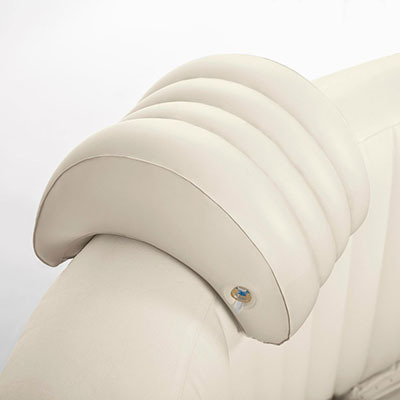 The Intex PureSpa Headrest is a great example of this neat little item. 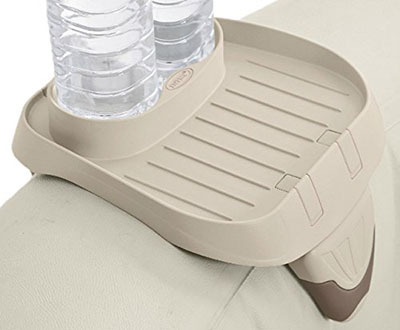 A hut tub headrest is typically filled with water that gives them a nice and comfortable feel. Even better this helps to weigh them down so they stay in place and don’t go sliding off. If you have neck or upper back pains, an inflatable hot tub headrest is a great purchase and can make all the difference between decent comfort and incredible comfort. One of the drawbacks to a typical inflatable hot tub is the lack of seating. However that can quickly be fixed with an inflatable hot tub seat. These handy little devices all you to elevate yourself off the floor and provide enhanced water circulation. Our top choice is the Intex PureSpa Spa Seat. Not only is it durable and able to withstand high heats, it’s really comfy as well. Once you get one, you’ll have all your guests fighting over who gets to use it. Just go ahead and grab four now to save yourself the trouble later. While we strongly recommend you take a shower before getting in a hot tub, sometimes it can just slip your mind. When that happens, body oils, suntan lotion and even cosmetics can quickly contaminate your water. The best way to get rid of all these oily substance is by grabbing a hot tub sponge. 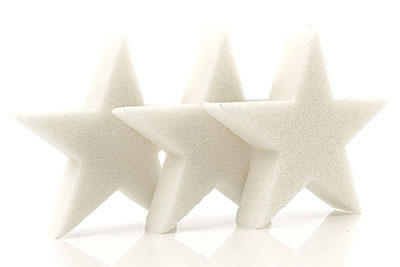 A great option is the Impresa Products Scum Star Oil Absorbing Sponge. This will allow you to quickly clean up any oils and help to maintain a clean and long lasting hot tub environment. If you’re looking to spice up your hot tub experience, go ahead and grab a set of Starfish Submersible LED lights. 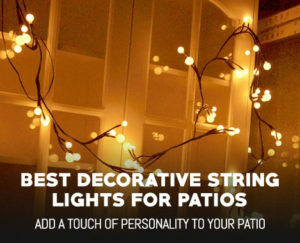 These cool little lights add a ton of ambiance to your hot tub and really help to set the mood. With various colors, hues and shades, they can quickly change to your desired color. Plus, because they are fully waterproof you can place them in the bottom of the hot tube for a truly unique experience. For the ultimate in Hot Tub Fun, go ahead and pick up the Bestway SaluSpa Inflatable Hot Tub Entertainment Station. This feature pack item has everything you need for a great weekend party. With an integrated Bluetooth 4.0 speaker, dual cup holders and a durable waterproof design, you’ll be jamming all weekend long. Plus, it has a built in rechargeable LiPO battery for an extended battery life, and enhanced cost savings when compared to traditional replaceable batteries. Overall this is a great accessory and well worth the money. In closing, there are a ton of great inflatable hot tubs out there, from cozy 2 person models to gargantuan 85” beasts. In the end, it’s your choice as to what fits your needs best and what you can afford. 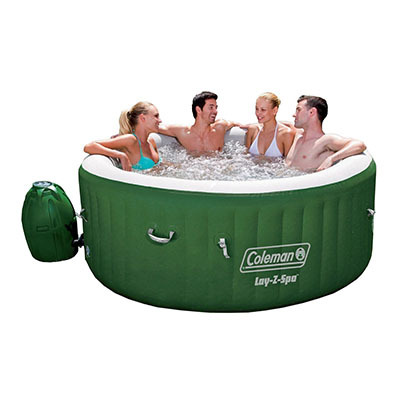 If we had to recommend one though we’d go with the Coleman SaluSpa 4 Person Portable Inflatable Outdoor Spa Hot Tub as it is an all around great product and offers a ton of awesome features for the price. Plus with a 4 person capacity it is roomy enough to relax in, but won’t take up your entire backyard. With that being said, you’ve now got all the information you need to make a well informed decision. Happy Hot tubbing!